It’s that time of year the garden is bursting with zucchini and we’re craving zucchini bread! Making an extra loaf lately just so I can make Zucchini Bread French Toast! Oh but wait there’s more! 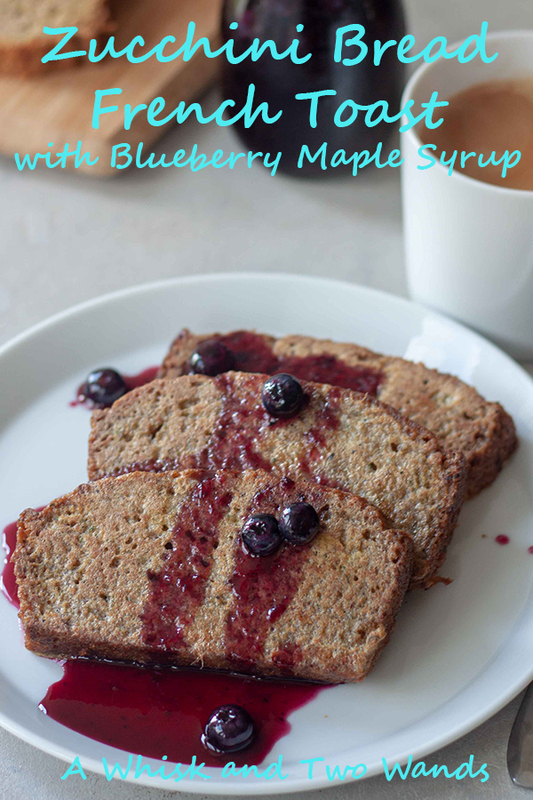 Blueberries are also in season, we’re eating so many I’m surprised we haven’t turned blue, and homemade Blueberry Maple Syrup is the perfect way to top our Zucchini Bread French Toast. YES Zucchini Bread French Toast with Blueberry Maple Syrup, so good I had to post a sneak on Instagram a week ago Sunday when I made it again and couldn’t contain my excitement! 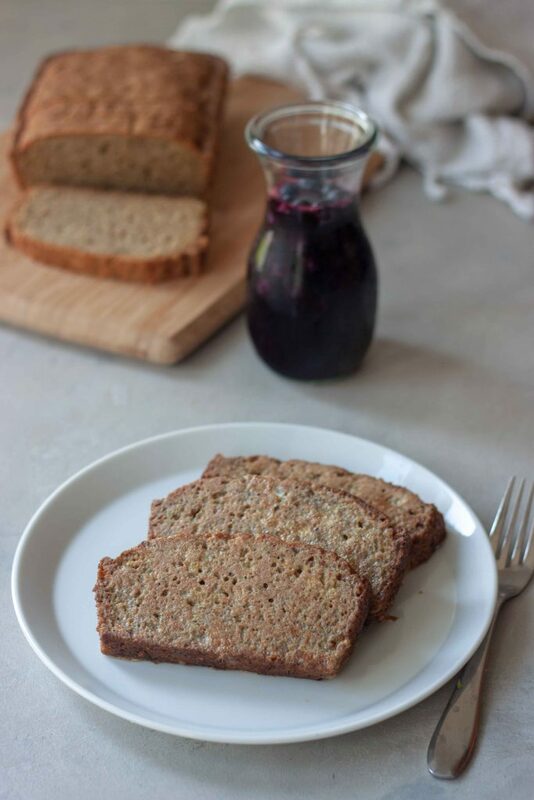 It was my mind all day last Monday and had plans to make another version on Tuesday morning for breakfast but with cooked pears only to wake up to one lonely slice of zucchini bread. Someone ATE MY ZUCCHINI BREAD! So instead I used the lonely slice to top my smoothie bowl. While I like to try to eat healthy and make classic or family recipes healthier there are some things, like grandma’s zucchini bread, that you really can’t mess too much with. This French toast was meant to fully be enjoyed and yes there are veggies with the zucchini but also sugar and I’m ok with that. I do use coconut palm sugar or a combination of. If you have a healthier zucchini bread recipe you want to use feel free to substitute it and you can still turn it into Zucchini Bread French Toast. We all know zucchini bread is best enjoyed within a couple days of making it but maybe you have some left over. Not that this every happens in my house but hey I guess it could happen if you make a lot and your family gets sick of eating it. This is a perfect way to use it. 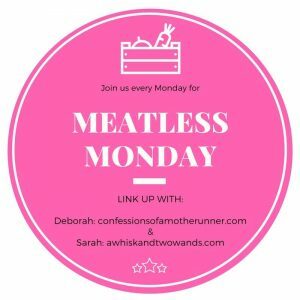 Or if you’ve already made countless zucchini recipes and not sure what else to make with it, try this trust me it it’s not just another zucchini recipe. For us I have to make an extra loaf so I can make this. Blueberry Maple Syrup is a must! It’s easy to make and is the perfect pairing. I even like to add some yogurt (I use coconut milk as it’s dairy free, you can use any plain or vanilla yogurt) to make it a real treat, adding it is optional. Oh and then there’s the pretzels I added last weekend that was what I was feeling and it was amazing but understand that some might not get that and something I wouldn’t add if serving it for company for brunch. 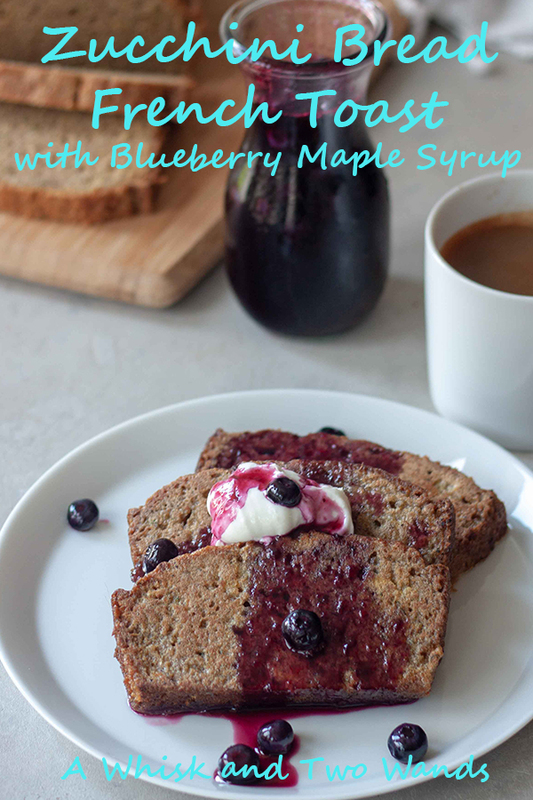 Not that there is anything wrong with that but this would be a real crowd pleaser at a brunch and I personally would want people to enjoy the simple seasonal pairing of the zucchini bread and Blueberry Maple Syrup. My family would understand if I pulled out the pretzels though because putting chips or pretzels on sweeter things, or in sandwiches is how I’ve rolled since I was a kid. Funny thing I don’t really like potato chips otherwise and pretty much only have them in sandwiches or on things and don’t snack on them. Imagine just sitting there on the weekend sipping coffee. savoring and enjoying each bite. Oh trust me this breakfast will sweeten any morning and put a smile on your face. 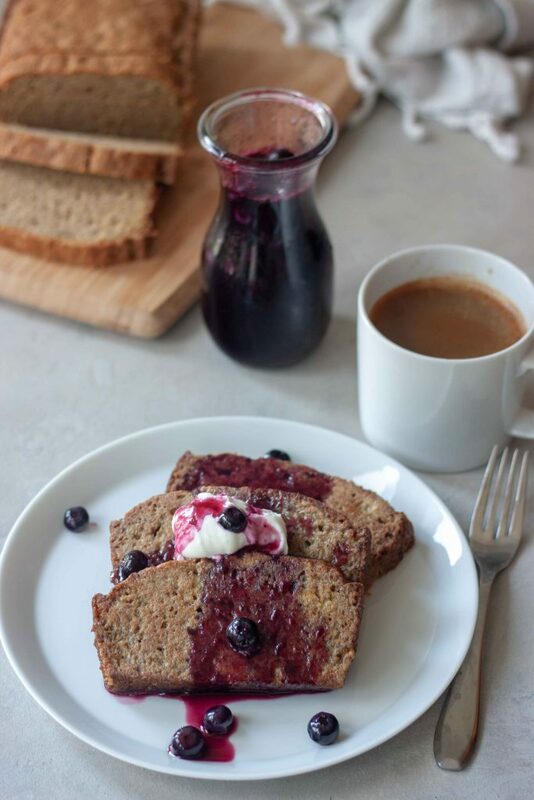 Today is Meatless Monday and I wish I was starting off my day and week with Zucchini Bread French Toast with Blueberry Maple Syrup but I made banana bread instead of zucchini bread yesterday. Doesn’t mean I won’t try to make it for dinner, I mean brinner, tonight. I look forward to seeing what’s happening in your kitchen and hope you link up with me and my co-host Deborah and share! I also hope you check out and are inspired by the recipes linked up below. Tis the season for our garden bursting with zucchini and picking big juicy blueberries! 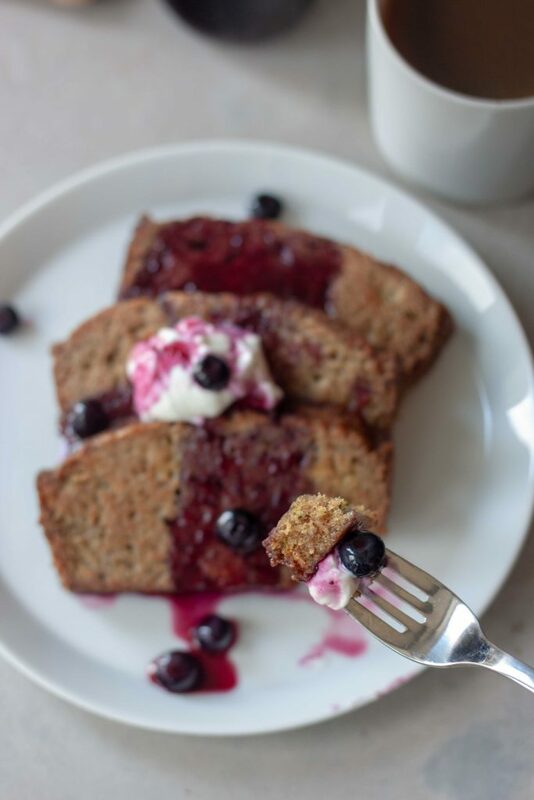 Pairing both in this Zucchini Bread French Toast with Blueberry Maple Syrup recipe perfect for a relaxing weekend breakfast or sharing with company for brunch. What better way to use up zucchini and that extra loaf of zucchini bread. Gluten free friendly. Heat cast iron pan or griddle over medium heat. Slice zucchini bread (you will want to make sure it is completely cooled) into 12 slices. In a shallow pan or bowl whisk together eggs, milk, and cinnamon. Coat pan/griddle with a little oil. Dip bread into the egg mixture, flip, removing excess and place on the hot griddle. Cook for about 4 minutes, flip and cook other side. Plate and top with Blueberry Maple Syrup and other toppings as desired. Bring maple syrup and 2 cups of blueberries to a boil. Remove from heat and smash blueberries with the back of a spoon. Carefully strain the mixture into a glass jar and stir in optional remaining cup of blueberries. Store in glass container in the fridge until ready to serve if you like chilled maple syrup like we do otherwise drizzle over your pancakes or waffles right away. Mix sugar, eggs, oil, and vanilla together in a large bowl. In a separate bowl mix flour, salt, baking soda, baking powder, and cinnamon together. Add dry ingredients into the wet and stir until just combine. Stir in zucchini. Line a 9x5 loaf pan with parchment paper and pour in batter. Bake for 1 hour and until toothpick comes out clean. Let cool for 5- 10 minutes before removing from the pan and placing on a wire rack to cool. This reminds me of an amazing breakfast spot I ate at that made their french toast with various breads such as this that you would traditionally eat on their own in San Francisco. It was so good..I had never had anything like it before. So good! Thanks for the memory! I bet this is awesome. ahhh- this looks so good! Now I am already wishing for the weekend.